Welcome to my How To Start A Photography Business series of articles. The purpose of these 10 articles, is to get you thinking about the possibilities of taking up photography as a business. If you want to go straight to a particular section of this free on-line course, then here are the titles of the other sections. I do have another series of articles on this site about how to make money with your camera, but those really just focus on simple ways you could make ‘a quick buck’. This set of articles aims to go a little deeper than that and considers the ‘whole business’. Have You Got What It Takes To Be A Freelance Photographer ? Being an entreprenear and running a small business is not for everyone. There’s lots to consider, including budgeting, time management, and the law. However, if you like taking photographs, you are well on your way to consider making this ‘hobby’ into a freelance photography career. Of course, taking the odd vacation snap, and actually running a business around photography are two different things. You really need to be passionate about it. So much so that your camera really needs to become an extension of your arm. The good news is that there are countless opportunities in the photography world, and it really is up to you which of these opportunities you take. I will explore some of the possibilities in these How To Start A Photography Business series of articles. You just need to be open-minded and willing to put in some time and effort to develop (no pun intended) your craft. This is also the type of business that you can very much start part-time, working in and around your existing full-time job. Some people even find part-time photography more lucrative than their ‘day-jobs’. With the advancement of today’s digital cameras, it has never been easier for the amateur to take professional looking photographs. That said, you do need to have an eye for a good shot, as no amount of auto-focusing and subsequent image enhancement can make up for a badly framed image. There are some obvious areas where you can start in this business, and I shall be covering them in future articles. If you are brave enough, then weddings are actually an excellent place to start – of course it does come with huge risks (not least for the bride and groom), and it can be a very stressful day. But also very rewarding. Other areas might include : work for newspapers and magazines, home-made greetings cards, working with models or portraits and, a particular favourite of mine, aerial photography. The portraits and models area can have endless possibilities. Local company leaflets and promotional material, web-sites, hair-dressing salons and clothing shops. It is easy to turn photographs into t-shirts, mugs and mouse mats today – which could add an additional stream of income, or even as an upsell to your basic photography business. To start off with, you really don’t need much more than a mid-range camera, possibly a tri-pod (depending on the photographs you are planning), and maybe invest in some lighting (for indoor work). You could consider a printer, but actually, as a start, I would consider getting them printed professionally at one of the many stores specialising in printing. Sure, it will reduce your profits, but there are deals to be done if you are putting a lot of business in the direction of a particular store. What Else Do I Need To Think About ? Photography can be seasonal. There is no doubting that work can be found all year round, but if you are going to specialize in any particular branch of photography (say weddings), then you might be restricting your work and, ultimately, your profits. If you enjoyed this introduction on how to start a photography business please feel free to share this with your friends using the social media buttons below. When thinking about buying your first digital camera, you need to do some research, to ensure that you pick up the one that’s going to best suit your needs. Fortunately, many of today’s cameras have many great features as standard, but for people looking to get a little bit more than basic snaps, then a little bit of planning can prevent money being thrown down the drain. If buying from a shop, then it is easy to get carried away with a salesman who might be more interested in his sales targets, than providing you with what you actually need. If buying on-line, you might be faced with many impressive pictures and a table full of specifications – but what do they all mean ? This article aims to cover the basics of digital camera terminology. The first thing to consider, when buying your first digital camera, is picture quality. In fact, for me, picture quality is everything. The quality on a digital camera is measured in megapixels. Put simply, the more megapixels (dots that make up the picture), the sharper will be the images produced with the camera. However, it should be noted that the higher the resolution, the more storage space each picture will take up on your memory cards / sticks – so there is a trade-off to consider. That said, storage cards are relatively cheap in today’s market. Realistically, you don’t want anything lower than a 5.0 megapixel camera – but unless you are looking to make a living out of your photos, or blowing them up for large wall photos, then you can probably get away with anything up to a 10.0 megapixel camera – and these are still very much at a budget price of less than $80.00. The next thing to consider is shutter speeds. When talking about shutter speeds, the numbers mentioned are in their 100’s – i.e. you might read that a camera has a shutter speed of 600. In reality, this means that the speed is 1/600 of a second. The rule of thumb is that if you are going to take lots of fast-moving sporting action, then you need a fast shutter speed. Slower shutter speeds are used in dimmer light, or when you want to add effects (like the trails seen with someone waving a sparkler or the effect seen with a long trail of car lights on a night-time shot). In reality, shutter speeds can vary from 1/16000 of a second to several hours (for photographing star trails, for example). Anywhere between 1/16 and 1/2000 will more than cover the average photographer’s needs. Put simply, the aperture is the hole through which the light travels. If it is narrow, then the image will be sharp. If the aperture is wide then the image will only be sharp on the thing that is being focused on – with the surrounding area being blurred. There will be occasions when a blurred image will be required (for effect). The aperture will also determine how dark the resultant image will be for any given exposure time. ISO initially referred to film speed and in particular that film’s sensitivity to light. However, like the other things mentioned in this article, the terminology has also transferred to the digital world, with much greater flexibility now. Previously you bought a whole film with a specific sensitivity (e.g. ISO 100). Now, you can change the ISO after every shot – depending on your surroundings. So, if you are out in the bright light, and then go inside (at a zoo for example) and didn’t want to use a flash, then you could adjust the ISO from 100 to (say) 1600, with a slow shutter speed (1/30 sec) and get excellent results. I’m not talking about the padded case that you put your camera in here. By storage, I’m referring to the memory cards that slot into the side of your camera. Everyone’s requirements will be different. In reality, you only need enough storage to be able to hold onto the pictures until you are in a position to download them onto your computer (or store for printing) and then clear the card (known as formatting) ready for use again. As mentioned previously, the higher the megapixel for each shot, the more storage you are going to need. Also, most cameras allow for MPEG movies to be taken. If you are in the habit of taking short video clips you are going to need significant storage space on your memory card / stick. That said, storage cards are large enough to hold several hundred photos – that’s more than enough for even the keenest of photographers on their two-week vacation. As a minimum, I would look for a storage card / stick at 1GB – although professionals might want to look at 16GB or even higher. I also tend to take a spare….. There’s nothing worse than having a camera with only one (damaged) storage card. I hope you enjoyed this brief look at digital camera basics. There will be more in-depth articles published at a later date, covering all elements of photography. Please feel free to share, using the social media links below. Welcome to my Nikon D3100 review page. Having spent a small fortune on digital cameras over the years, there is one that really impresses me. 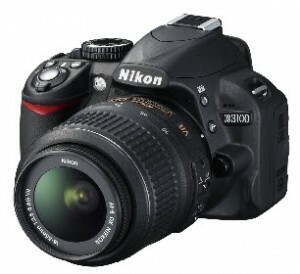 The Nikon D3100 Digital SLR. True, it’s not the most expensive camera I’ve ever purchased, or the one with the best specifications. However, it is a solid all round performer. It is a top seller on Amazon.com, and for a very good reason – it is an awesome piece of equipment, pitched for amateurs and professionals alike. This has something for everyone. 14.2-megapixel DX-format CMOS image sensor; 3-inch monitor with One-Touch Live View shooting and movie capture. Includes 3x 18-55mm Zoom-NIKKOR VR Image Stabilization lens. Full 1080p HD Cinematic Video with full-time autofocus and sound. Easy-To-Use Nikon Guide Mode with intuitive controls and on-board assistance. Capture images to SD/SDHC/SDXC memory cards (not included). From my own point of view, I would say that this camera will make you shoot like a pro if you get some basic knowledge on how to compose your frame. Although it is an entry-level camera, it produces as good as, if not better, pictures from its expensive counterparts. The price – there’s a lot of bang for your buck with the D3100 camera. 14 megapixels – more than enough at this price range and allow you to make large prints of shots without sacrificing quality. Large LCD screen – particularly good for ensuring that everyone has their eyes open at group shots (without having to zoom in to each persons faces). It’s small & light weight and has good grip – useful for my careless hands. I’ve tried continuous shooting and the 3fps speed was quick enough for what I needed. The only thing that I picked up on during this Nikon D3100 review was the fact that when in VERY quiet surroundings you can hear the lens focusing when recording video – but then you get that with many cameras. Of course, with any amount of background noise then you can’t hear the motor at all. If you’re buying a DSLR specifically for video capabilities, then maybe you should be thinking about a camcorder anyway. Also the self-timer has just two settings 10 sec or 2 sec. It would be nice to be able to define this yourself for say 5 seconds rather than 2 – small point, but I like self-portraits. I did note that there were professional photographers commenting on the review page saying how close to a professional camera it really is – for a fraction of the cost. For the price, this is a massively fantastic deal. I’m quite happy to say that the Nikon D3100 is one of the best cameras I have ever owned. For additional Nikon D3100 reviews or to purchase, please click on the image below. Please share this Nikon D3100 review using the social media links below. 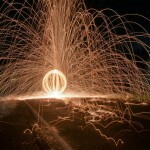 Welcome to my review of Evan Sharboneau’s Trick Photography and Special Effects course. written the latest book on photography tricks (unfortunately, many of them are just marketers who actually know nothing about photography). Well, there’s a course that caught my eye recently. 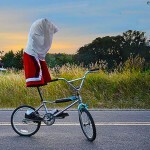 It’s by Evan Sharboneau, who has successfully managed to put together a very comprehensive course on trick photography. Sure, the advent of Photoshop has made manipulating photographs easier than it was ‘back in the day’ but the real skill is using your camera to get those eye boggling images in the first place. Some of the photography tricks in the course are quite outstanding but are very easy to replicate. Whilst I have articles on this website about trick photography and special effects you can achieve with a camera, I really haven’t gone anywhere near the detail that Evan has in this fantastic course. On this page I will provide you with a detailed account of what’s inside the course AND I’m going to start off by showing you one of Evan’s tutorials (see below). I hope you enjoyed that……there’s plenty more of those…….. 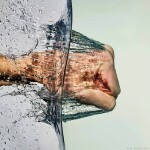 Trick Photography and Special Effects – What’s Inside The Course ? Okay, in this initial part of the review, I’m going to walk you through the actual members area. I’ll uncover what’s behind the main tabs below. On this page, you will see a link to be able to download the book and the four bonus e-books. Each comes in straight forward PDF format (so simply right-click and “save as…”, OR you can download them in a zipped files). I have gone into some detail regarding the e-book contents below. In here are three modules, to coincide with the modules in the book. The 55 videos total nine hours in length. Many of the videos run up to 20 minutes in length, so you really do get to see a detailed view of every trick photography example covered. Some are obviously shorter (5 minutes long), depending on the complexity of the topic being covered. The beauty of the videos are that they have been recorded in HD, so I’d fully recommend that you use the full screen feature on each of the videos and you won’t lose any of the quality in doing so. Evan does provide his clients with his private email address and is more than happy to answer any issues you might be having. Now, I’d like to delve a bit deeper into the actual course…………. There is a nice little section at the start which talks about the ideal type of camera bodies and lenses you should use (you don’t always need and expensive dslr either) and also a bit on tripods and photo-shop software. Once that is done, we really are into the training modules. little bit of experimentation you’ll be amazed what your $100 camera can really achieve. Useful tips are included at this point concerning shutter speeds, setting the aperture and ISO, setting the white balance and generic common settings for light paintings. Next are the fundamentals of lighting, including flashlights and LEDs and also guidance on using fiber optic adaptors and where you can buy all these cheaply. But fear not, you do not need a stack of costly accessories to get the most out of this course. There is plenty here even if you don’t buy all of these additional tools. Having said that, Evan then discusses LED strips (even how to build them yourself), Bayco work lights and fairy lights (how to make orbs with these). Then there are laser pens, fibre optics, cathodes (and how to make one cheaply), glow sticks, glow in the dark paint. We then move onto long exposure of city lights, star trail images, capturing fire, EL Wire (don’t worry if you don’t understand the terminology of some of this stuff – you would have seen photos with these effects on). The module then goes into numerous techniques looking at motion blur (e.g. waterfalls, star trails) and long exposure techniques. 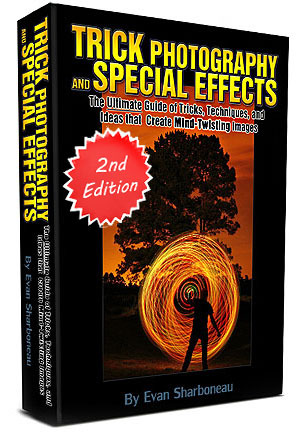 This chapter contains more traditional trick photography that anyone can do with even the most basic of camera. 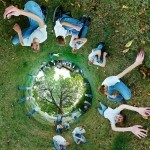 Topics covered include, illusions and forced perspective. Upside down reflections and 3D photography are very well covered (using one or two SLR cameras), and also high-speed photography. One thing I’ve really improved on is smoke trick photography. What I learnt here really helped sharpen up my images. Infra-red photography also gets a tutorial as does the increasingly popular 360 degree photography (See photo at the top of this page – I’ve seen a lot of people posting these on Facebook recently). This is where it is useful to have Photoshop or some other photo editor software. Having said that, this section is independent from the other chapters and there are free on-line versions of Photoshop readily available. can obtain it from here : Photoshop Express. There are plenty of effects covered in this module, including : Layer Masks, Levitation (people floating in mid-air), invisible man (see photo to the right), and many more. There is a lot more besides, but please take a look at Evan’s website (link below) for more information. As I said previously, I have not seen anything like some of this stuff before, so learning these techniques will arguably give you an advantage when entering photo contests (if that’s your thing), or for ‘selling’ your work to photographic websites (that’s the core of my business now and well worth looking into if you are not already doing this). This e-book goes over the basics concepts like aperture, depth of field and bokeh, shutter speed, ISO, focusing, white balance, how to get the sharpest photo possible, various accessories you can get for your camera, etc. Using an off-camera flash can be very useful when photographing people. This e-book tells you about the most popular techniques and suggests useful equipment needed to get started right away. Learn how to get your photos accepted into stock photography agencies and how to sell photos as fine art prints. As I mentioned above this is the ‘core’ of my business now and is very lucrative !!! This e-book reviews the effects filters and Photoshop plug-ins so you’ll know how to create fun and trippy effects. I have to admit, as a professional photographer of 27 years, even I’ve missed out on many of the photography tips detailed in these books during my career. I highly recommend these books to amateurs and professionals alike. Please click on the link below to visit Evans official site and see some of the amazing photography tricks that you could be doing soon. Click on the image below to visit the Trick Photography official website. If you enjoyed this trick photography and special effects course review, then please feel free to share this page with your friends using the social media buttons below.